The SRS-XB3 is Sony's first water-resistant portable speaker that will be replacing the SRS-X33 released a year ago and is aimed at JBL's Charge 3 and Ultimate Ears' UE Boom 2 speakers. Underneath its resilient body, the SRS-XB3 features dual passive bass radiators and newly developed front-facing full-range 48mm drivers, a 24-hour battery life and Sony's LDAC Bluetooth technology for high-resolution audio streaming. Sony has also implemented dual pairing funtionality which will let you wirelessly connect two speakers together for stereo or amplified listening experience. The SRS-XB3 has a dual-sided design that can be used to place it upright or on its side. It can also charge external devices like iPhones and iPads. The SRS-XB3 will be available this spring in black, red and blue. Sony's more expensive model, the h.ear go SRS-HG1, isn't water-resistant but does have a higher quality construction with a purpose built speaker box to help isolate left and right speaker channels for greater stereo separation and audio clarity. The SRS-HG1 speaker features up to 12 hours of battery life, dual 35mm full-range drivers and passive bass radiators and is high-resolution audio compatible thanks to its use of Wi-Fi and digital sound enhancement features. 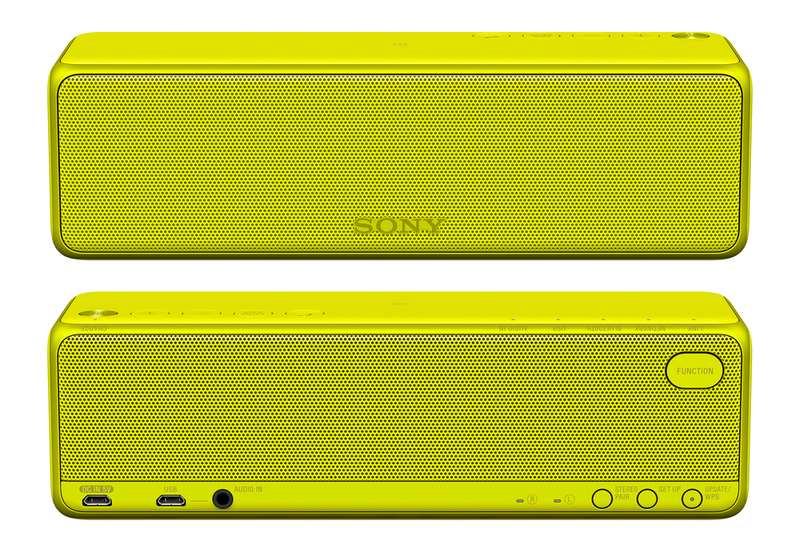 Like the SRS-XB3, the h.ear go can also wirelessly connect to multiple speakers for a multi-room, stereo or surround sound using Sony's SongPal Link app. The h.ear go SRS-HG1 speaker will also be available this spring in 5 vibrant colors.